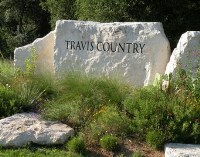 Updated, open, one-story stone home on low traffic, tree-lined street in Travis Country. No carpet (all bamboo & tile). Huge master suite, large secondary bedrooms. Stainless appliances/gorgeous counters. Appliances can stay. HVAC/energy upgrades 12/2010. Backyard entirely landscaped for entertaining/low water use. Front yard is native grass, never needs mowing. Extra workshop space in garage. TC has miles of trails,2 pools, parks and is ideally located to quickly access downtown, new Whole Foods, etc.